This statement is highlighted in a December 2017 article about the ongoing research efforts of Professor Margaret Barrett of the University of Australia, Queensland. Barrett began receiving grants to study the different effects of various types of musical exposure on young children in 2001. By 2013, she had honed in on a study called “Being and Becoming Musical.” At that point, Professor Graham Welch, Established Chair of Music Education at the University College London’s Institute of Education, joined her and her team. 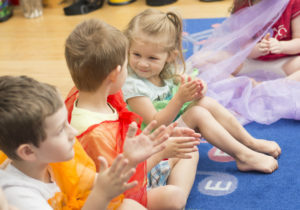 Data drawn from 3,100 families who participated in the study led the team to this conclusion: “shared music-making at the age of 2–3 years correlates positively with increased school readiness, pro-social skills, and literacy and numeracy outcomes at age 4–5.” That’s some powerful evidence in favor of music! WHAT DO SHARED MUSICAL EXPERIENCES LOOK LIKE? Parents and children made up simple songs to sing together during routines, such as bath time or meal time. Parents put simple tunes to the words they used to describe what they were doing with children while doing those things—whether it was building with blocks, walking in nature, or dressing to go somewhere. So, rather than simply commenting on how good the warm sun feels, parents might sing about it to a familiar tune like “Twinkle, Twinkle Little Star”: Shiny, shiny sun so high, shiny, shiny in the sky. Thanks for warming us today. You make it nice for us to play. Shiny, shiny sun so high, shiny, shiny in the sky. Parents and children made up movements and danced together while listening to music. Parents and children figured out how to make instruments like rattles and drums using things around the house, then played them together. One particularly interesting finding stemmed from the fact that the research team was careful to include parents who ranged from “not at all musical” to “play a musical instrument” in the study. No matter what the parents’ musical background or comfort with making music, the shared musical experiences with their children had positive outcomes. So don’t let any discomfort you might have get in the way of enjoying musical experiences with your child! Music brings joy. Period. WHAT ELSE WAS INTERESTING ABOUT THE STUDY? 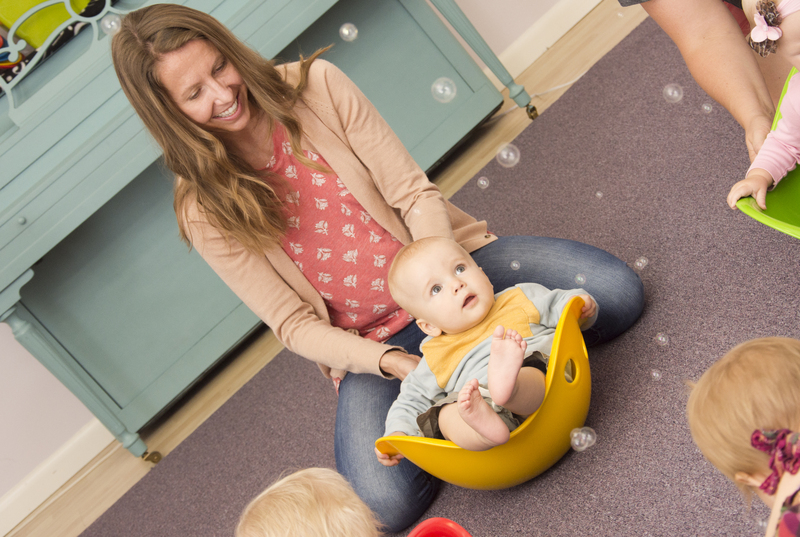 Dr. Barrett and her team became especially fascinated with the idea that purposeful shared musical experiences had a bonus effect…on the parents! She saw clear signs of something she is calling “musical parenting.” She theorizes that music leads to great opportunities for parent-child bonding. She believes it can help to “foster stronger family relationships.” So stay tuned for more research coming out of the Barrett team providing statistical support for this belief! Meanwhile, don’t let any time pass before making shared musical experiences as important in your family life as reading aloud hopefully already is. 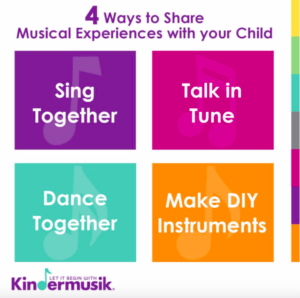 You’re already engaging in this way through Kindermusik classes, but don’t forget your Kindermusik Online at-home materials. And enroll now in our Summermusik classes or pick out your Fall class, and keep that music happening year-round.